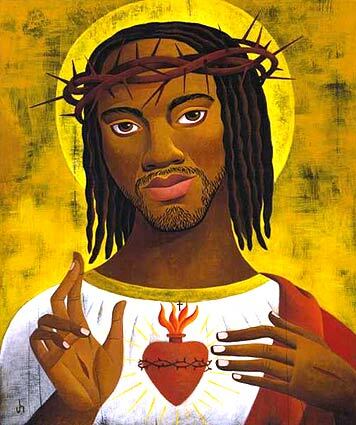 Vol.84.1: WHERE IS BLACK JESUS, ANYWAY? Sugar: “I wonder what Jesus,” he spoke about Christ with that ‘personal savior’ assurance, “will use to get us up to the clouds?” he replied, as though the Rapture was an absolute certainty. Somewhere I read recently a proposal that perhaps airlines should begin charging for their tickets on a scale proportionate to the weight of the passenger. Weight, in passenger and luggage, is related to the amount of fuel that an airliner consumes getting us from one place to another— more weight the more fuel, the more fuel per passenger, the less profit for the airline. It seems reasonable; why should some forty pound six-year-old girl have to pay the same amount as a full-size porky adult. Kids even have less luggage. Proportionality, another term for fairness (something we Americans are supposedly fond of), seems quite reasonable in this context. “Oh, oh,” you say, now he’s going to get all non-PC about overweight people. “Hasn’t he been watching these recent movies with the cute, funny tubby woman who is a (ahem) ‘barrel of laughs’? 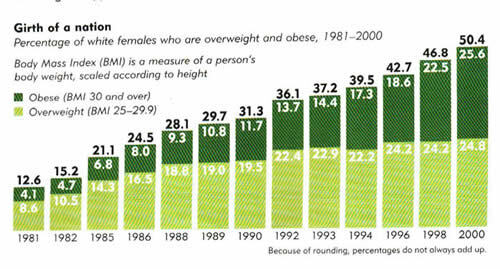 It is not the thing these days to remark, at least openly and other than in our thoughts, about people who are overweight/fat/obese. That could be a form of bigotry. Okay, I could end this very quickly with two words: Paula Deen. (Yes, there are fat bigots). I am not sure what the woman’s disability was, or even if it was a result of the fact that she was extremely overweight, but she was brought to the aircraft door in a wheelchair, her husband preceded her with armloads of blankets and carry-ons far in excess of what is allowed, and she was helped (with an additional hand by me) to the window seat into which she had great difficulty fitting herself. “Sugar” then had similar difficulty inserting himself into the middle seat and, was unable to physically obey his wife’s exhortation to “not squeeze that nice man (that’s me, an she couldn’t read my thoughts) out into the aisle.” Despite the fact that he sat mostly with his arms folded across his chest, I had to fly bent about 15° to the left of vertical for three hours and fifty-five minutes, making my head a piñata for every thunderous hip and thigh making its ponderous way to the restroom. My seatmates spent most of their time playing with their smart phones, except when the Mrs. happened to spy a particularly metaphysical cloud formation. Tthat merited an elbow jab to her husband that communicated itself to me and knocking me out of the light doze in which I was attempting to dream of wandering alone in a grassy savanna, an Arctic tundra, floating on a raft in mid ocean, or anywhere that would afford me an imaginary sensation of boundless personal space. So, unable to sleep I decided to occupy my thoughts with the conundrum (at least to me) of why African-Americans worship the White God. Now before you think that I am indeed injecting color into this discussion, it is not so much that Jesus was a white guy (I think). I could understand why any racial group might conjure their supreme deity in features that somewhat reflect their own; but my issue is that Christian African-Americans seem to be worshiping the very God that those who enslaved them worship, and are those “Massas” also used the same Bible as a scriptural basis to regard those of Black African descent as lesser beings than themselves. Is African-American adoption of Christianity some sort of Stockholm syndrome, some sort of wish to belong or be accepted by the very people who have, and still to some degree, oppressed them? Or, maybe they just like the fairytale. They could just as easily sing gospel music about some Black Jesus. She: “Sugar, Jesus can do anything. I think he will make some sort of elevator, or escalator to get us up on those clouds,” she said confidently. *Which raises another economic point: that there are definitely very heavy people who can afford to pay whatever “the traffic will bear.” It’s just that they are more likely to make their “weight–price” by purchasing Economy class tickets, where seat size becomes a critical concern for those seated beside them. **They do sell “seatbelt extenders” for such passengers. Perhaps the answer is for the airlines to include a select number of seats that are sized for what can be euphemistically referred to as “plus sized” passengers, with commensurately–sized surcharges.